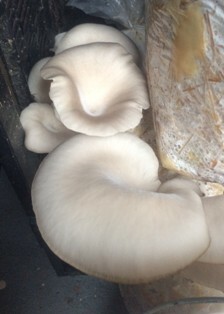 - Store in the refrigerator in a vented box or in a brown paper bag to allow the mushrooms to breathe. You may notice that after a few days or a week they will start to dry out. This is fine! They will still cook up beautifully, especially in a sauce or risotto. - Cook with plenty of oil and pay attention! The tastiest mushrooms are nicely browned, but not burnt. Shiitake These are our most common mushrooms. They have a dark brown cap and white stem and are used frequently in Asian cooking. If they are fresh you can chop and use the stems, otherwise remove the stems and reserve them for stock. The caps can be cooked whole, sliced, or chopped. This mushrooms has a strong, earthy flavor and withstands a lot of cooking. This recipe for Sauteed Shiitakes with Teriyaki Sauce is one of Farmer Elizabeth's favorite ways to prepare them. Shiitakes have the longest shelf life and can keep for up to a week in the fridge. 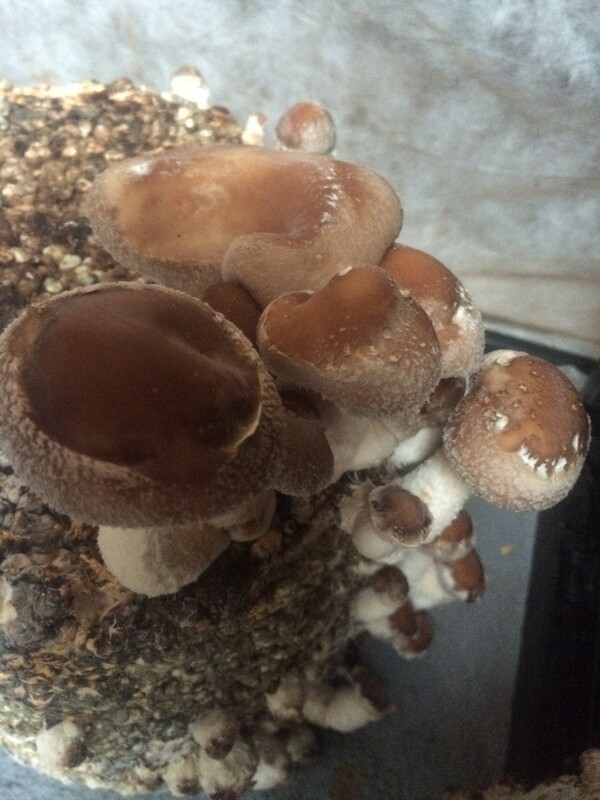 Oyster Oyster Mushrooms grow in clusters of flat mushrooms. 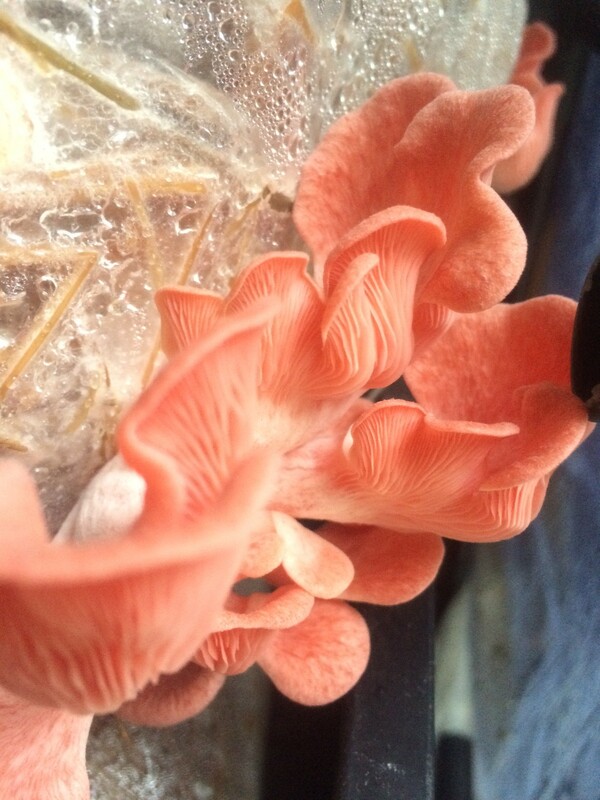 These range from tiny clusters with cap that are 1/2" across to ruffly mushrooms larger than your hand. The color ranges from dark grey to brown to white depending on the growing conditions. There are also pink and yellow varieties. These are delicate both in flavor and how much cooking they can withstand. They also have the shortest shelf life, so if you purchase these mushrooms plan to use them in a day or two. Small clusters can be left in tact while larger ones can be sliced. Farmer Elizabeth's favorite preparation of this variety is to marinate the mushrooms in a generous amount of olive oil & lemon juice for an hour. Grill (use foil with oil to keep them from sticking) and watch closely to brown without burning. Salt or add a sauce after grilling. Lions Mane This white, fuzzy mushroom is so intriguing that most folks immediately want to pet it! It is fuzzy! This mushroom is known for its delicate seafood/lobster flavor. Perhaps this is because the most often recommended method for cooking is to fry it in butter. (Although butter burns easily so you may wish to fry in another oil and finish with a little butter). Here is more info about these delicious, fuzzy mushrooms and a recipe. Wine Cap Grown outside on woodchips, this mushroom is seasonal and dependent on Mother Nature. Also called King Straphoria, this variety is a great complement to gardens. The mushrooms can grow up to 5# each! Because it is grown outside, you may notice more blemishes or bug holes. Click this link for recipe ideas.